We’d love your help. 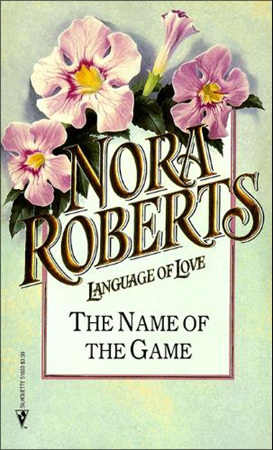 Let us know what’s wrong with this preview of The Name of the Game by Nora Roberts. Letting go has never been more scary--or intoxicating--in this electrifying story from #1 "New York Times "bestselling author Nora Roberts. TV producer Johanna Patterson knows that the entertainment industry is a man's world--especially for a man like Sam Weaver. His tough good looks have propelled him to movie stardom. But Johanna c Available digitally for the first time. TV producer Johanna Patterson knows that the entertainment industry is a man's world--especially for a man like Sam Weaver. His tough good looks have propelled him to movie stardom. But Johanna can't be won over by a pretty face. The problem is that Sam is not quite the man Johanna thought he was. He's better. And for a woman who forgot what it means to be surprised, Sam has an uncanny way of making her lose her self control with his easy confidence and laid-back charm. And the mind-blowing kisses help, too... Includes a preview of "The Perfect Hope." To ask other readers questions about The Name of the Game, please sign up. Books With Flowers on the Covers! This story has to be about twenty years old by now and shows that not all old romance books had weak, pathetic heroines that let their men walk all over them. The h was my kind of female protagonist - stubborn, sometimes cranky, always prickly and hard to get close to - I loved that. 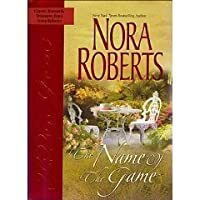 The H was still an arrogant alpha male, but he also had all the traits I often find and like by Nora Roberts. He is a nice and friendly decent human being. Although the story is super short, is was also kind of slow and as always with these kind of short little books, there was a lot of room to explore more of other interesting tropes - like the relationship with her parents and such. They fall in love rather fast, there is no angst and no drama - at least a little bit would have spiced the story up a little bit. Lido depois de uns anos e continuo a achar a Johanna uma mulher complicada, eu percebo que ela não quisesse ceder ao glamour de Hollywood e de Sam mas as desculpas que ela arranja são completamente estapafúrdias, o legado da mãe e o facto de nenhuma relação com atores funcionar? Really? Muito morno para mim, salvou-se o Sam que era um doce e uma personagem com tiradas muito engraçadas! I'll start by saying I wasn't a fan of the storyline. It was based around hollywood. With Johanna being a television show producer. I didn't care about all the little details that went into that. I also didn't care so much for the characters outside of Sam and Johannah. So, what's the point of reading if I didn't enjoy the storyline? Well, I really liked the romance. Sam could have any woman he wanted and Johannah knew just as much. So, why is this super hot movie star after her? What could she p I'll start by saying I wasn't a fan of the storyline. It was based around hollywood. With Johanna being a television show producer. I didn't care about all the little details that went into that. I also didn't care so much for the characters outside of Sam and Johannah. Este livro foi-me oferecido em Fevereiro deste ano e, como estava arrumado na estante desde essa altura, decidi finalmente pegar nele durante este mês para que pudesse ser lido. Este é um livro recheado de luxúria, tensão, amizade, amor, desejo, drama, paixão e intriga desde o início até ao fim, com um enredo simples mas apelativo e com personagens muito interessantes, complexas, fortes e reais. Como de costume, a escrita da autora mostra-se leve e descontraída e proporciona uma leitura muito agra Este livro foi-me oferecido em Fevereiro deste ano e, como estava arrumado na estante desde essa altura, decidi finalmente pegar nele durante este mês para que pudesse ser lido. Como de costume, a escrita da autora mostra-se leve e descontraída e proporciona uma leitura muito agradável e descomplicada. Por fim, deixo aqui a nota de que gostei mesmo bastante deste pequeno livro, mais do que estava à espera - e ainda que tivesse gostado de ver algumas partes a serem mais desenvolvidas, isso não levou a que adorasse menos esta história, de todo. I quite liked this vintage Nora Roberts story. The plot was steady, the characters well defined, and the romance was sweet with just enough spice to keep things interesting. The story didn't feel as dated as some of Robert's other stories from the same decade. Johanna was stubborn until the end. She realized Sam loved her and wanted a future with her in it. There were no guarantees as far as marriage was concerned but she was his. Rigid game show producer Johanna Patterson is pursued by actor Sam Weaver. Wat zal ik eens zeggen over dit boek. kort gezegd is dit totaal geen boek wat mij aangetrokken Heb, heb het geprobeerd te waarderen maar nog een keer lezen nee dat doe ik dan maar niet. A reprint from 1988. Although things have definitely changed since the 1980's this book is still a fun read. Good for a silhouette, Nora Roberts is certainly an excellent writer and can pack a lot of development into a few pages. The Hero was a sweetheart and fought for his lady. Макар и прилежно написана с пълноценно представени герои, нещо в сюжета ме спира да харесам тази книга. Може би защото е клише от началото до края. Typical Nora Roberts fare, you're always guaranteed a happy ending!!! A good looking, just made it star (having made his way up); extended loving family in Texas; a good all-around guy; has horses, and pool, and bbq at his home; Johanna has been negotiating with his agent to get him on her show, and shows up in agent’s office with the contract… and he’s hooked – his ho hum attitude shifts into high gear. And it’s a sweet story… he leaves to film on the east coast, she gets her night time show launched… and finds that she misses him… and she drops it all, and heads to NY… where he greets her with open arms. NR tidak pernah tanggung2 jika membuat sebuah cerita, dan tidak pernah lupa mengerjakan PRnya. Membaca buku ini membawa pikiran saya melayang, membayangkan sebuah proses produksi sebuah acara quiz, tekanan2nya. Dan seperti biasa, NR melukiskan sebuah lokasi dengan sangat menarik, seperti saat dia melukiskan lokasi peternakan Sam. Johannna adalah putri produser yg terkenal, hidup dibawah bayang2 sang ayah, belajar dengan guru yg terbaik, itu yang Johanna lakukan seumur hidupnya, sehingga dia bisa NR tidak pernah tanggung2 jika membuat sebuah cerita, dan tidak pernah lupa mengerjakan PRnya. Membaca buku ini membawa pikiran saya melayang, membayangkan sebuah proses produksi sebuah acara quiz, tekanan2nya. Dan seperti biasa, NR melukiskan sebuah lokasi dengan sangat menarik, seperti saat dia melukiskan lokasi peternakan Sam. Johannna adalah putri produser yg terkenal, hidup dibawah bayang2 sang ayah, belajar dengan guru yg terbaik, itu yang Johanna lakukan seumur hidupnya, sehingga dia bisa menjadi seorang produser yg handal dengan cita2 memiliki perusahaan produksi sendiri. Kehidupan perkawinan sang ayah mempengaruhi kehidupan pribadinya sehingga sulit rasanya untuk mempercayai itikat baik Sam terhadap dirinya. Johanna Patterson is dreaming of Sam Weaver, the actor. She is running the contest show and he's made a deal with her that if he wins the next 2 games, she will have dinner with him. He's very smart. Love how to get away from the pressures of her job she gardens. Detailed descriptions about the colors and different flowers she has planted and takes care of herself. Love the places he takes her to that she's never experienced. He's on vacation now but she will be working many hours overtime during the same time. He gave her a gift that she can't resist. Although he is there for her in every way when her father has a medical emergency, she tells him about her past. Actually started this book a while back, then picked it back up again earlier this week. (I was only about 20 pages in when I put it down in favor of something else). This was pretty good story from Nora's backlist. Liked the hero a lot - the heroine was conflicted for a long time, but her reasons for that were understandable. I gave it four stars because she frustrated me, but this is worth the read. I was hooked by Johanna's strong but vulnerable character. Roberts seems to have a flare for creating characters like that and I loved reading about her sorting through those and finally coming to see and understand herself and all of the things that contributed to who she is. Sam was totally lovable; the guy who knew when to push forward and when to retreat. He was perfect for Johanna and I loved him to pieces. Cute, heartwarming read! I really enjoyed it. For once, I liked the hero. He wasn't a dark, brooding, tortured artiste. He was a good guy, and a bit of a sweetheart. The story was sweet - boy meets girl, boy chases girl, boy and girl fall in love, and resolve girl's commitment issues so they can live happily ever after. Um romance simples. A personagem de Johanna foi bem desenvolvida, com as suas dúvidas e conflitos em relação ao amor e compromisso, devido à promiscuidade dos pais. Sam era mesmo o que lhe fazia falta. Dated (1988) and poorly written, yet still reissued in 2010. How did Nora Roberts develop the reputation she has? ? Another fun read by Roberts. About a game show producer who falls for one of the actor's who guest stars on her show. Very cute. No real surprises in this story.